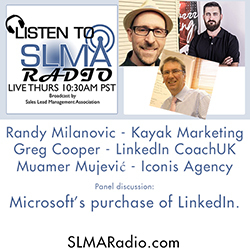 How will Microsoft's purchase of LinkedIn affect users? Randy is an author and principal of KAYAK Online Marketing. He has worked extensively with more than 400 companies and organizations just like yours. He truly understands the goals of marketing managers and businesses to generate high quality leads and build their businesses. His online marketing books, Findability: Why Search Optimization is Dying + 21 New Rules of Content Marketing (May 2013), and Building a Better Business Website: 10 Crucial Strategies for Turning Your Online Presence Into Something Your Company Can Actually Use (Oct 2013) are both available on Amazon Kindle (12 languages) and in Paperback (English). And recently, leading the collaborative ebook: Disruption: How Successful People are Using Social for Business (June 2015). Randy has been featured, guest blogged, or mentioned in a variety of online media, including: forbes.com, steamfeed.com, socialmediatoday.com, financial post.com,spinsucks.com, the Calgary Herald, Rogers Connect and more. Greg Cooper says, "For 20 years I ran an award winning B2B tech marketing agency working for clients like IBM, Microsoft and SAP, generating leads and gathering marketing intelligence. I sold this business in 2011. Today I work as an independent LinkedIn consultant and trainer with a focus on business development.My clients are small and medium sized businesses and business units of larger enterprises. It was a pleasure meeting him for this episode. He tells us a bit about himself and Iconis, "I'm the Creative Director at Iconis Agency and I work with clients in various industries in Croatia and UK. Over the years my team and I created many successful marketing and social media campaigns, launched new brands, re-branded old ones, and designed high quality web sites and e-commerce platforms. Most of all I love building brands, from simple concepts, brand language, visual identity to brand strategy. For me, brands are about people, emotions and stories, so creating them is truly satisfying. My other passion is strategic marketing consulting, where I guide entrepreneurs and companies in digital marketing, branding and social media."